Years of eating coins dropped at the bottom of a pond has rendered a sea turtle in pain, and headed to the surgery ward. The 25-year-old Thai sea turtle was discovered living in a pond in Si Racha, a town on the east coast of Thailand, according to the Bangkok Post. Vets conducted a CT scan and discovered a lump of coins measuring an alarming 20 x 23 x 30 cm (7.8 x 9 x 11 in.) in the turtle's body, pressing down on its ventral shell (or the turtle's belly), causing it to be cracked, swollen and infected. Scans also showed a fish hook in her intestine. 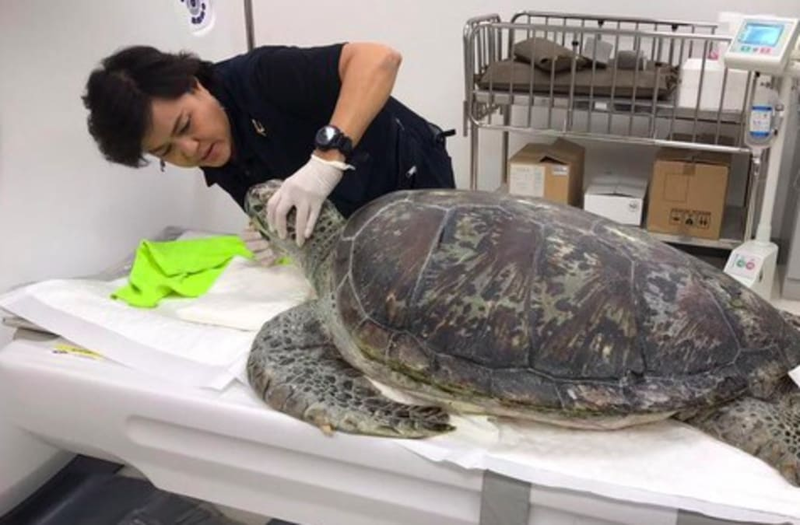 The turtle was brought to Chulalongkorn University by the Royal Thai Naval Air and Coastal Defence Command, where they found roughly 2,000 baht ($57.37) worth of coins in its tummy, the Metro reported. The turtle, nicknamed Bank, was also suffering from a severe lung infection, which was preventing it from diving, breathing and eating properly. Vets hope that they can operate on her to remove the coins in two weeks, after her overall health condition improves under care. Nantarika Chansue, the associate professor at Chulalongkorn University spearheading Bank's recovery, told Metro that the weight of the coins was making her move more sluggishly. "The pain was slowly torturing the poor creature," she added. Bank would have died if not for the immediate intervention, Nantarika told the Bangkok Post. Fortunately, she adds, donors have already raised 15,000 baht towards the cost of performing a CT scan on her. Nantarika hopes that people will stop throwing coins into ponds with aquatic life, writing in a Facebook post: "It is a serious sin."